Time flies doesn’t it and when you have milestones to mark the helter-skelter ride of life, the speed at which we are all travelling is scarily polarised. And so it is with @LucyCorrander #treefollowing blog that is updated on the 7th of every month. 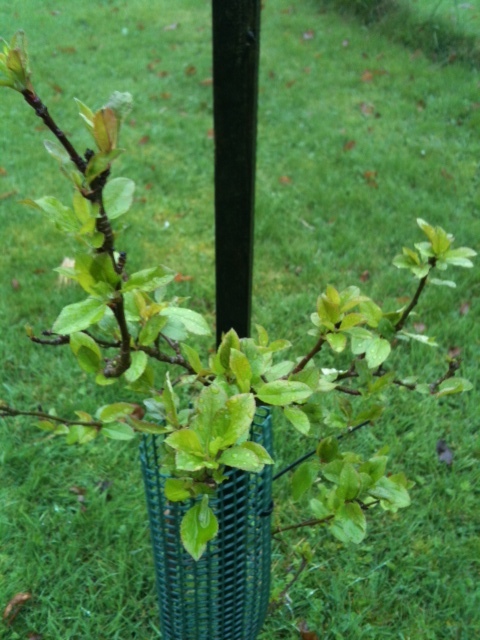 The first post can be read here: https://sophia-moseley.com/2014/03/07/im-following-a-tree-for-loose-and-leafy-lucycorrander/ where I introduced a rather special apple tree sapling. I have been particularly concerned about our young and innocent tree that has been nurtured since he was but a single pip planted by my young son in that unguarded and optimistic hope that all children have. My greatest concern however, was that after carting him around in his small pot for several years whilst we moved from house to house, he would not take kindly to being ‘planted out’ in the big bad world and when we suffered the horrendous weather during the latter part of 2013 and early 2014, I feared the worst. But our little sapling is clearly a chip off the old block, or more accurately as it is my son’s tree, the young block because he managed to stay upright throughout those stormy months. When I wrote my first post for Lucy, I wasn’t sure if I would have anything more to show after 4 weeks and I nervously visited our sapling each day and became increasingly concerned when I noticed a patch of green lichen on one of his thin delicate branches. 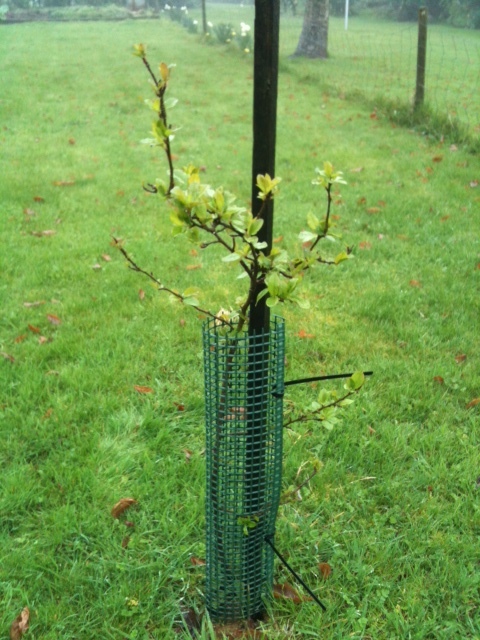 Had the traumatic transplant and our rather scrawny sapling’s newfound freedom been too much to bear? But just one week after I had posted Part 1 I am pleased to say I saw definite evidence of life; minute bronze brown wisps had appeared at the end of some of the tiny branches. It was quite a momentous occasion and I happily regularly trotted down to the bottom of the garden in all weathers to take a look at developments. But it must have been that brief fleeting moment of sunshine and warmth we had around 17 days ago that finally brought about a BIG change. Leaves. Not just one or two, but several and all of them green and healthy. So from the pip of the first apple my first born ate, it would seem that unfettered juvenile enthusiasm for life and living that my son demonstrated at just 35 months old has rubbed off onto his apple tree. Who knows, perhaps there really is something in the theory that plants can hear and dare I say…heal? 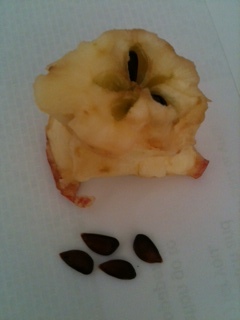 This entry was posted in Tree Following and tagged apple tree, lucy corrander, tree following project, treefollowing. Bookmark the permalink. Loads of tension and triumphant finale. But surprised a fleck of lichen suggested to you that the tree might be in trouble. Could that really be so? I always associate moss/lichen with dead/decaying stage of plant life, so I put 2 & 2 together to make 5 and assumed our poor little sapling was in trouble!! But seems I was very wrong. He’s a tough little chap it seems! I wonder, in this respect, if there’s a difference between moss and lichen. Thank you Juliet, clean air and clean living in west Dorset! 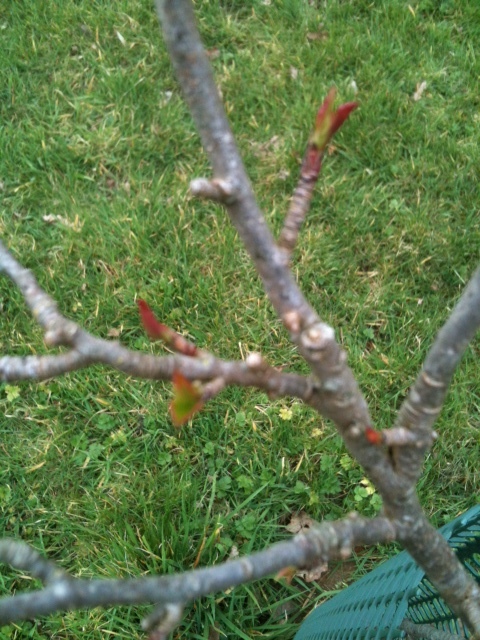 It certainly is a big relief to see so many new leaves. Thank you! It is indeed very heartening. Just wondering if I dare to hope for blossom, but that might be a bit too big an expectation!